JACKSONVILLE -- A woman who kidnapped a newborn at a Jacksonville hospital 20 years ago and raised the baby girl as her own apologized to her and her biological parents during an emotional sentencing hearing Friday. The sentencing hearing for 52-year-old Gloria Williams was stretching into its second day in a Jacksonville courtroom Friday when Williams took the stand, WJAX's Christy Turner reports via Twitter. Williams posed as a nurse at the hospital's maternity ward in 1998 when she approached Shanara Mobley eight hours after her daughter, Kamiyah Mobley, was born. She took the baby and disappeared. Williams took Kamiyah to South Carolina, where she raised her as Alexis Manigo. The ruse began falling apart two years ago when the girl tried to get a driver's license but didn't have a valid birth certificate. Williams was arrested in 2017 and pleaded guilty to kidnapping in March. Judge Mariane Aho could give Williams 22 years. Prosecutors argued that Williams abducted the girl in a cold and calculated manner and the crime continued for 18 years, while her defense attorneys said she has no other criminal history and plans to continue her education upon her release. After hearing their arguments, a judge set a sentencing imposition date for June 8. Williams apologized to Kamiyah, now 20, who was sitting in the courtroom. "I never meant to hurt you. I never meant to cause you any harm, any pain, any of that. I'm sorry," Williams said. "I hope you can find it in your heart to forgive me. I tried to love you the best way I could." Williams also apologized to Kamiyah's parents, who gave emotional testimony Thursday, saying the abduction "destroyed" them. She asked for their forgiveness. "I know I can't give you back the 18 years," Williams said. "If I could, I would." Williams testified that her relationship with Charles Manigo, the man Kamiyah Mobley believed to be her father, was abusive and that she had suffered a miscarriage before the abduction. Williams said she didn't go to the Jacksonville hospital the day of the abduction intending to kidnap a baby. She said had been depressed and drove south that day "with no plans." When she arrived at the maternity ward she said she was at first only looking at the babies and thinking about the child she lost. Williams admitted entering the room of Shanara Mobley, who she didn't know, and taking the baby. She said she thought the child would bring peace to her home and that "the abuse would stop, the violence would stop, but it didn't." She said she later ended her relationship with Charles Manigo. Williams described Kamiyah as a "joy" and a "doll baby" but said she fought with herself for years about returning the child, saying she knew she would eventually "get caught." 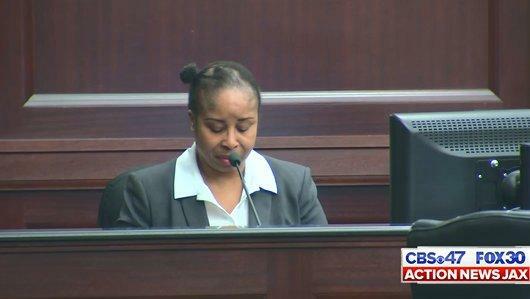 She described how she explained to Kamiyah as a teenager that she had been abducted as a newborn. "I told her you are not my daughter," Williams said. "I said, 'I took you a long time ago.'" Williams cried as the defense played video of Williams and Kamiyah embracing at a police station after her 2017 arrest. Facing a tough cross-examination from prosecutors, Williams admitted that she put the newborn in a bag when she left the hospital and that it was a selfish decision. "What I remember is I was running, I was walking and at any time someone could grab my arm and say 'What do you have in the bag?'" Williams said. She also admitted that she thought about taking the baby back, but didn't. On Thursday, Shanara Mobley broke down on the stand Thursday as she addressed her daughter, who was sitting in the courtroom gallery, reports CBS affiliate WJAX. "It doesn't heal. I'm still hurting. I am your mother, Kamiyah. I am your mother!" she said. Mobley testified she believes Williams should be sentenced to death, but because it's not on the table she urged Aho to hand her to the maximum prison term of 22 years.